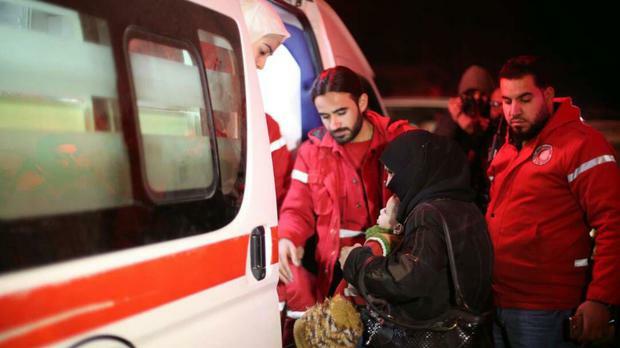 An evacuation of critically ill Syrians trapped in a rebel-held suburb near the capital Damascus is under way. The International Committee for the Red Cross said the evacuation is taking place following reports that conditions in the area had reached alarming levels. Activists said the evacuation from eastern Ghouta began late Tuesday, when five patients left the area. The International Committee of the Red Cross (ICRC), partnering with the local Syrian Arab Red Crescent (SARC) , are handling the evacuations. SARC spokeswoman Mona Kurdi said they arrived in hospitals in government-controlled Damascus. The Army of Islam, a prominent rebel group in eastern Ghouta, said 29 critically ill residents will be evacuated as part of a deal that was conditional on it releasing an equivalent number of captives it held. As part of the nearly seven-year conflict, the government recently tightened its siege on the suburb, home to nearly 400,000 people. The United Nations said the government had refused to allow hundreds of critically ill to reach hospitals only minutes away and blocked trucks filled with humanitarian relief. Turkey President Recep Tayyip Erdogan had said his government is working with Russia to try to evacuate some 500 people from eastern Ghouta, including about 170 women and children, who are in urgent need of humanitarian or medical assistance. Turkey is a leading supporter of the Syrian opposition, while Russia is allied with President Bashar Assad. Images of children with severe malnutrition and reports of civilians dying because of a lack of treatment hung over recent UN-led talks for peace in Geneva. According to the UN, roughly one in eight children are malnourished in eastern Ghouta - a jump from one in 50 in May. In a recent report, the ICRC said the conditions have reached a critical point. "No military or political gains could justify this amount of suffering," ICRC Middle East director Robert Mardini said earlier this month. Rights groups have accused the government of committing war crimes by using sieges as a tactic to starve the local population and force rebel groups to surrender. Earlier this month, the UN said 12 people had died waiting for medical evacuation from eastern Ghouta. Their names were on a UN-drawn list submitted to the government six months ago. Eastern Ghouta was one of the early suburbs to fall to rebel control following protests against the Syrian government. It has been besieged by the government since 2013, but tunnels and smuggling have kept basic foods and medical supplies flowing. The government tightened the noose earlier this year, amid its successive military victories against armed opponents elsewhere in Syria. But a political agreement to end the conflict remains elusive. On Wednesday, Russia's foreign minister said a Moscow-proposed peace congress scheduled for next month is crucial for reaching a settlement in Syria. Sergey Lavrov said the Russian effort will not hamper separate UN-led talks, also expected to resume next month. Mr Lavrov's statement on Wednesday comes a day after several dozen Syrian opposition groups issued a series of statements saying the talks in Russia's Sochi next month are an attempt to "circumvent" the UN-led peace process. Mr Lavrov, who was meeting with Syrian opposition leader Ahmad Jarba on Wednesday, told Russian news agencies that the Sochi congress would lay the groundwork for UN-led talks. The Russian minister said Russia's goal is to bring together the largest number of opposition groups possible to help launch constitutional reform in the war-torn country. The Syrian government is supportive of the Sochi process. ICRC spokeswoman Ingy Sedky said: "There are many more people who need to be evacuated. We hope this will be only the beginning." The evacuees included three children as young as one. The patients, who travelled with family members, needed immediate treatment for such things as cancer and kidney failure. Some patients may not be able to leave eastern Ghouta for government-controlled areas, because they either fear conscription into the army or detention for having lived or worked in opposition areas. By Kathleen Foody People have marked the 20th anniversary of the Columbine High School shooting in suburban Denver by attending a remembrance ceremony.